The idea behind this scalping strategy is to catch the short wave retracements that take place when the market reaches a peak overbought or oversold state. The method can be used in any markets but it is best (and has least risk) when the market is range bound. It is a low yielding strategy. Although the profits are not huge, they are consistent when the system is correctly applied. I have used this method over several months on both one-minute (M1) and five-minute (M5) time frames. Though, it can easily be adapted to work at different timescales if you choose. Unlike most other scalpers, this method enters the market on triggers from an indicator as well as price action signals at each bar. A key element of this is that it spreads risk across a number of trades to create a scalp sequence. This averaging out is essential in restricting drawdowns and creating incremental profits. With this approach, trades are allowed to drawdown. By contrast, many scalping systems abandon a trade as soon as it enters a loss. But because the exposure is spread among a group of trades the impact of drawdown is limited. And because of the need to allow trades to enter a loss, it is not advisable to use this method with aggressive leverage. You can adjust the setup for more risk or less risk as required. I use a combined entry signal that detects likely turning points. 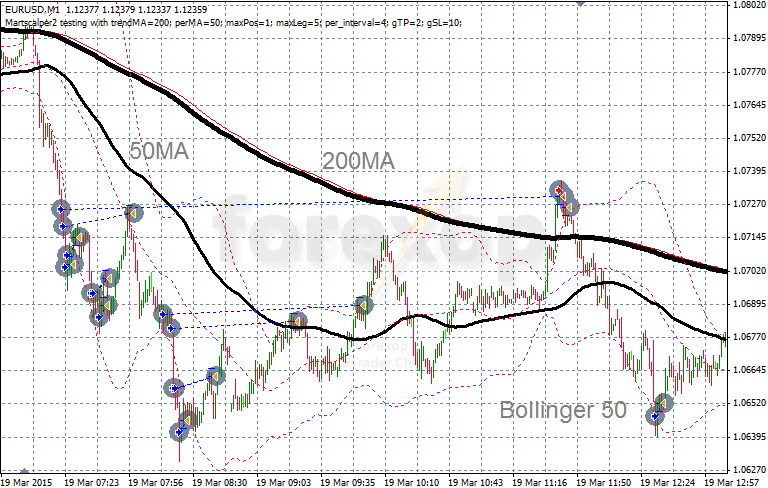 To do this I use a combination of the Bollinger band lines and by examining the price action at each bar. Two conditions have to be met to trigger the entry. The first condition is that the price has to be at an extremity marked as one of the outer Bollinger band lines. An overbought/oversold state occurs when the bar touches one of the outer bands. The band parameters are adjusted for the chart, so that around 95% of the price high/lows are enclosed inside the bands. When the price is at a lower band, this meets the first condition for a entering long (buy). When the price is at the upper band, this meets the first condition for entering short (sell). Because the Bollinger is a lagging (delayed) indicator, a real time input is also necessary to improve the odds of each scalp run resulting in a profit. This input comes from examining the recent candle activity. For the second condition, the current bar has to start retracing back towards (or inside) the band after reaching its high (low) point. This indicates that a brief pullback is taking place after reaching a short-term overbought/oversold state. For example for a buy signal, the price has to start retracing back up towards the center line of the band. For a sell signal, the price starts to retrace downwards. If these conditions are met the trade is entered provided the total open volume is not exceeded. Since the system works best in tight ranges it’s also advisable to use a range finding tool to prevent (or limit) trades in trending markets. Figure 1 shows a typical scalp sequence. The strategy will open trades between set time intervals until it reaches the maximum volume. As mentioned above, I use no more than one lot per $10k so the exposure is fairly low. This is not a frenetic, high turnover scalping system. Using these entry signals there are rarely more than around 10 potential trades per day. The stop is set at no greater than half of the width of the Bollinger band. So for example, if the bandwidth is 20 pips, the stop is placed half way at 10 pips. The take profit amount is also set depending on the volatility. I set this around 5% of the bandwidth (typically 1-6 pips) but this should be varied depending on recent price history. At tick #1, I place a market buy to open order after the price descends to the lower Bollinger and after the first bar starts to retrace back towards the center line. At tick #2 the price moves in the direction of the scalp. At tick #3, the price pulls back but reverses again. My target profit of 6 pips is achieved at tick #4. This system is good for capturing small profits caused by market volatility. Statistically we know that most trades will enter profit at some point owing to natural market movements. This scalper takes advantage of this. With this approach, the profits can run by setting a higher profit target. The trader can vary the profit level according the strength of the current trend reversal. This is ideal for capturing the strong retracements that happen at market extremes. Figure 2 below demonstrates this in a real trading scenario. 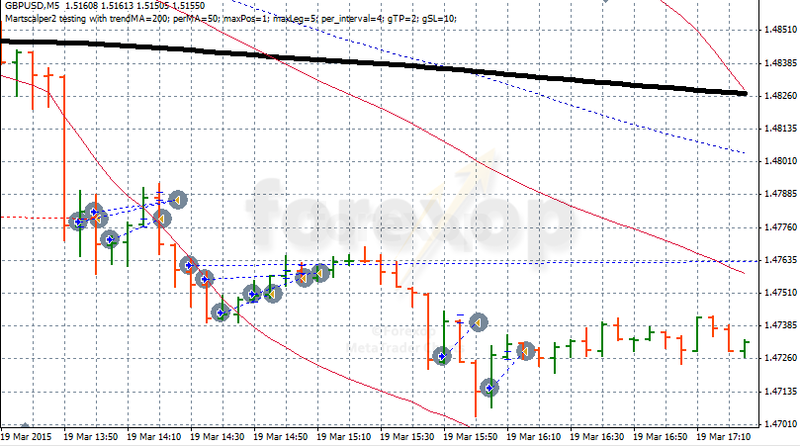 This shows a small sequence of the test run of the strategy on the EUR/USD one minute chart (M1). The chart shows the complete sequence of four buy orders. The spread is set at 2.1 pips for each test. The sequence starts at order #206. At this instant the price action satisfies both conditions of being within the threshold of the lower Bollinger band (to trigger a buy order) and the bar starts to retrace back towards the center line. The second bar triggers another buy order as the price meets the entry conditions again. The price then pulls lower and the first two positions briefly enter drawdown. Following this, there are two more bars triggering entries, which results in four executed buy orders (see Figure 2). The price continues to rise. After two more bars, the exit points for #208 and #209 are reached. This captures a profit of 0.432 and 0.17. At this point, the price moves high enough to trigger the exit for orders #206 and #207 as well. This happens in the next bars leaving profits of 0.64 and 0.72. The final P&L for the sequence is $1.96. The chart above shows a typical run of sell orders while below shows a sequence of buy orders. The example below shows a run on pair GBP/USD (M5). The spread in Metatrader was set at 21 points (2.1 pips) again. The run completes 285 trades with a total profit of $168.85 (1689 pips). The next test shows a run on EUR/USD (M1). The spread again was set at 21 points. The run completes 394 trades with a total profit of $204.28 (2043 pips). Finally, this run shows a EUR/GBP (M5) using the same parameters. The run completes 270 trades with a total profit of $156.84 (1568 pips). 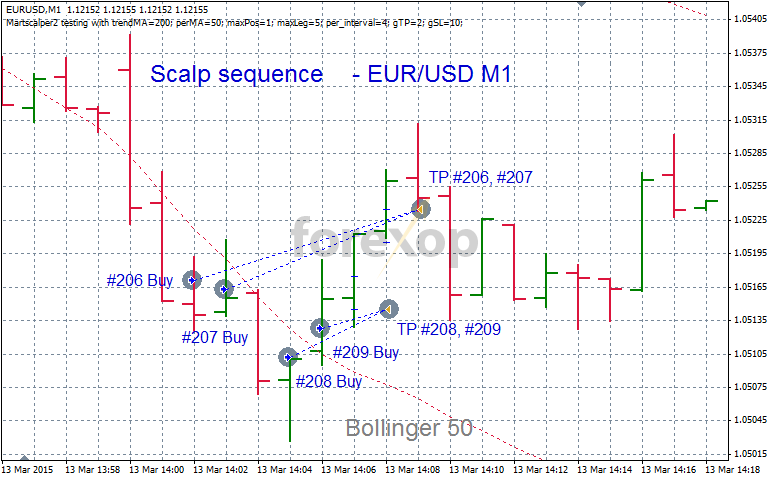 This article outlines a simple scalping strategy that can be used to trade ranges. This technique does not generate large numbers of trades as do some scalping methods so it is suited to manual trading as well as automation. This is a low yield strategy that does not work well with high leverage. As with all scalpers, success lies in precise timing of the entry and exit points. Refinement of these factors can make this a steady profit generator. Choice of suitable liquid currency pairs with low spreads and low slippage is also key to success. Hi what is the best to use to find ranges? I want to ask about the range indicator tool, can the indicator be used to create my own EA? Or its a fixed indicator? If this indicator cannot be used, then what other indicator can I use to find range? What’s recommended leverage for this method? Is 1:500 ok? For small capital 250 dollars. Hey Steve I know you said one should follow the newsletter but how would I go about downloading this ea now? Thanks Steve for this great website , tool and articles..I am currently using your FX hedge tool mt4 indicator and would like to know when exactly it will expire.Thank you and keep up the good works. You can use it for a few months before anything will expire. There is a renew option. Hello Steve. Nice article. This EA is for sale? Because I didn’t see it in downloads. I already registered and suscribed. Please check the other replies below. i would like to purchase the EA. i want to know if you have made an ea for this strategy. if yes, pls tell me the price and how i can get it. I see a 200 SMA on figure 1, above. It appears that longs only are filtered below the displayed 200 SMA and shorts only are filtered above the 200 SMA – please confirm this unique filter. I am not sure why there is a 50 SMA shown and how it is used. A 50 BB should line up with a 50 SMA and this is not. The SMA isn’t needed – it’s just there behind the Bollinger. The two don’t align because there are different calculation methods. E.g. median, exponential or weighted which do give a slightly different position to the line on Bollinger and the moving average. Overall the results should be about the same whichever is used. With respect to the standard length 20 or any other golden number I don’t see any benefit in following that rigidly. Hi Steve. Thanks for this idea. How many trades you recommend to keep open on any single scalp run? In some of the examples you show there you have up to 5 trades open & and all those on the same side. I just wondered if there is a rule and at what you apply to manage those trades when open. How does the close work? They all close at their own stop or they all close at the same time? As a general rule I would open a trade in a batch of orders rather than in one block in almost any situation. 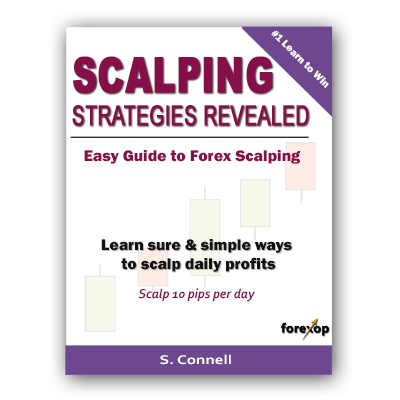 Scalping is no different to any other strategy in this respect. I still apply the same rule. I do this because it averages out spread and entry price. The exact number of orders would be calculated from the risk limits (max order lots) so the overall exposure is the same. There’s no necessity to do this though if you have another approach go for it and let us know. Hi steve if i wan this ea how? Just register on the mailing list please as we periodically make EAs and other offerings available to subscribers. Where can I purchase online the EA product? Please subscribe to the newsletter to receive updates on EAs and other products. Nice article. Tried this on a 5 minute charts using all major pairs. Once price touches/ crosses, I wait for a retracement 1-2 pip below the band to enter a trade. If the distance between the bands are 50 pips, SL would be 25 pips. Correct? 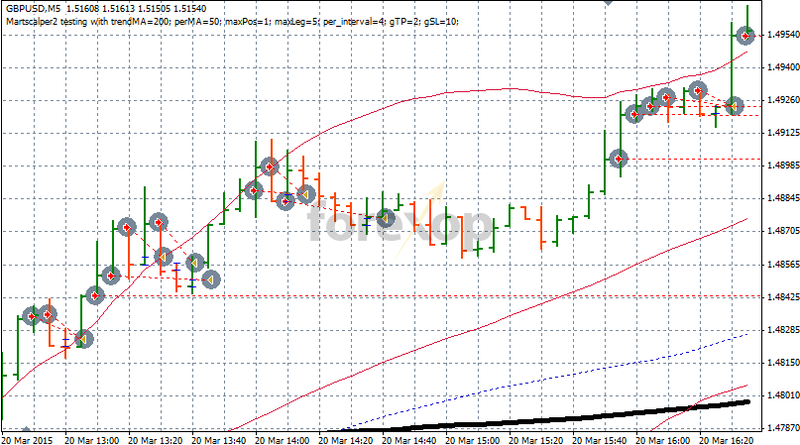 … TP was around 3-5 pips on every trade. I made around 15 trades and won most, but the few trades that hit the SL wiped all my profits. Is there anything wrong with what I described? Or should I keep using it for longer? Is there a specific time where this strategy work best? It can be a problem with this technique. I do try to confine the entries to tight ranges for this reason because the profits can run away very quickly if you get caught the wrong side of a strong trend. Do you have an expert adviser for this strategy that you can share? I have an EA yes but its a commercial product so not available as a freebie at this time. can i have the link for purchase? Please check the downloads page from time to time to see what is available. One question, how did you code the second condition into Metatrader? As I understand the “starts retracing back” rule requires a bit of human feeling, did you input an arbitrary retrace value to wait? In any case, do you actually trade this system using the Metatrader adviser or was it just for illustration purposes? The second condition is the tricky one and that has the most bearing on the result. I have several variations but the one I used for the tests was to wait for the candle to extend a certain threshold amount according to the volatility. So say the volatility gives an average variation of 5 pips per candle I would wait for it to extend X% beyond that range. I would also look at the behavior of the previous candle to see if that gave a rise or a fall. Next, wait for retracement by Y% and that would trigger the entry. I also put in some logic to prevent it being caught by breakouts. So if the move is beyond a certain amount (again no fixed value but based on vol measures) no entry is made at that point.